Grilling beer can chicken creates a moist meat that has a smoky grilled flavor. This grilling process is so easy and uses just simple seasoning to make delicious chicken that is perfect for a Memorial Day backyard barbecue with friends and family. See how to make this fresh strawberry ice cream for a special Memorial Day treat. 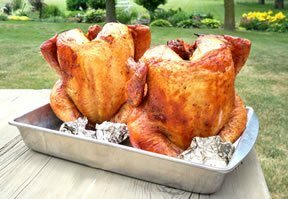 Step-by-step instructions on how to rotisserie grill a whole chicken to include in your Memorial Day menu.